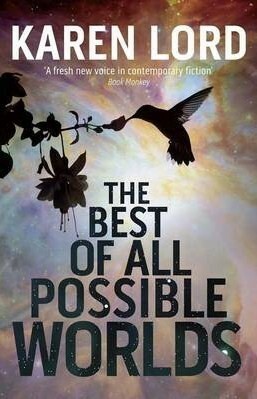 The Best of all Possible Worlds is a slightly strange novel. I suspect that I did not quite comprehend everything that's in it. The back story is treated as so incidental that I occasionally felt a little lost. The novel begins with a bit of a shock: a disaster / genocide has befallen a race of humanoid aliens. One branch of the remnants from the disaster is now starting a colony on an Earth-like planet that is a kind of refuge for races and nations from across the universe. All are human(ish), and they either live in little colonies and settlements on the frontier, or in big urban cities. There, we meet Grace Delarua, a bubbly civil servant / scientist / researcher, who liaises with the newly arrived aliens. After a while, they decide to form an expedition to sample and meet many of the colonies on the frontier, to check for genetic and societal compatibility, in order to start a breeding programme to revive the near extinct race. All of which sounds bewildering and high-concept and somewhere outside my usual reading zone. But, truth to be told, this is not really a novel about plot. Or rather: I ended up finding the plot incredibly incidental. The start is slow and confusing. Most of the middle is taken up with an episodic "meet culture, experience reaction, move on" or "have travelling adventure, experience reaction, move on" type chapters. It's a bit like watching a slide show or a nature documentary. Curious, but not perhaps hugely memorable. Some people seem to be very taken with the fact that the Fair Folk make an appearance of sorts, but I had no reaction to that chapter whatsoever. I think part of the reason is that our main characters are scientists, and therefore a little detached, even when in the middle of a grand adventure. The mood of the book is, at times, a little like the music video to the song "Little Talks" by the band "Of Monsters and Men": wide-eyed wonder and joyful adventuring, but with a sense of detachment. Perhaps the best way to sum up the plot is this: it reads like a sightseeing tour, a record of explorers, travelling and encountering people. There are no heroes, no villains, and even though there is nominally a point to the explorations, there is no sense that this is a quest. Where the book really comes together is in the relationship between the explorers on the expedition. Richly realised, complex, grown up and human. Characters are drawn with a light touch and huge writerly elegance. More importantly, this is a piece without villains, so while there might be occasional tensions, and some characters don't really like each other all that much, they all work together, they're all mostly professional (with occasional human moments), and they all have, for want of a better word, souls. But even the story of character relationships is not some operatic tale: it is a very mellow book, with very mellow developments and movements. There are many very human moments in the story, little, endearing, amusing moments, and also disturbing and cruel moments. Dialogue sparkles. There is genuine rapport between characters, and authentic frictions that don't always have specific reasons. Occasionally, characters fall under the influence of stimulants or telepathy or other factors, and I can honestly say that I am in awe of the writing skill in creating these scenes, where the narration becomes a little less reliable, and where the reader is left to reconstruct and reinterpret things by themselves after the scenes have taken place. The book trusts readers' intelligence, and it deserves multiple readings. The prose is excellent. The characterisation is excellent. The plot is not perhaps for everyone - it is quite mellow and never really builds up great tension - but the episodic, exposition-rich nature of it is carried out very well. There are things I am still unclear about - I don't get the (title) reference to Candide, some of the races and their motivations / characteristics befuddle me (What are the taSadiri again? And who did what to the Sadiri and why? ), and some of the mythology towards the end felt a little forced and pointless to me, but despite all that, it is a fantastic novel, showing great craftsmanship in its writing and great humanity. I am sure that I will re-read this book in future to get a better sense of all the background and references that I did not quite absorb properly in my first reading. But I am also sure that the novel is an acquired taste: it is very subtle and mellow for a science fiction novel. However, rest assured that it is never pretentious and a pure joy to read.